Solar Water Heating FAQs | Solar Panels | Solar Power | Site Map | Bookmark This Site! - How does a solar water heater work? - What are the components of a solar domestic water heating system? 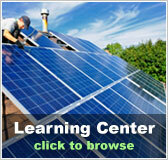 - What is the difference between a passive solar heater and an active one? - What type of backup system do I need? - By what amount does solar water heating reduce emissions? - What is the energy efficiency of a solar water heating system? - What can I expect to spend on a solar water heating system? 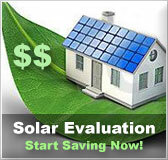 - What is the annual operating cost of a solar water heating system? Water circulates between the solar storage tank and solar collectors. When a household hot tap is opened, the solar storage tank releases pre-heated water into the conventional gas, electric or oil water heater, which only fires its burner or heating element if the desired temperature cannot be maintained by the solar heater. What are the components of a solar domestic water heating system? A water system is composed of a well-insulated storage tank, solar collectors, and inlet and outlet systems. In two-tank systems, the solar water heater preheats water before it enters the existing gas, electric or oil water heater. The number and size of the solar panels for your roof depends on your water usage, as well as collector orientation and geographic location. What is the difference between a passive solar heater and an active one? Passive heating systems have no moving parts and use the sun as the sole external energy source. In a passive solar water heating system, the storage tank is installed on the roof, often with structural bracing. A passive solar heater relies on thermosyphon action instead of a pump. They are a cost-effective and reliable solar water heating option. Ideal for areas in which temperatures rarely fall below freezing. The system consists of one or more black 40 gallon water tanks placed in a well-insulated box that acts as Integral Collector Storage, or a batch heater. Cold water flows in from the bottom where glass or plastic helps the tanks capture solar energy. Using local water pressure, hot water flows out of the top and into the conventional water heater where your thermostat determines if the water is already hot enough for use or if additional heat is necessary. Water flows through the system when warm water rises as cooler water sinks. The collector must be installed below the storage tank so that warm water will rise into the tank. Active solar water heaters operate with collectors, sensors, circulating pumps and controller mechanisms. Pumps circulate household water through the collectors and into the home, eliminating the need for a heavy storage tank. More efficient, direct systems must be allowed to drain to prevent damage from freezing or overheating. Instead of directly heating household water, pumps circulate a non-freezing, heat-transfer fluid such as Freon, distilled water or propylene glycol through the collectors. The heated fluid then travels to a heat exchanger, which heats household water. Indirect circulation systems are popular in climates prone to freezing temperatures. What type of backup system do I need? A backup system helps compensate for cloudy days and increased hot water demand. Rooftop tanks with thermosyphon systems serve as a back-up heating source. By what amount does solar water heating reduce emissions? By reducing natural gas consumption, solar water heating reduces carbon dioxide emissions by approximately 2,000 lbs per water heater every year. The system also reduces nitrous oxide emissions by approximately 1 pound per water heater each year. What is the energy efficiency of a solar water heating system? To calculate the energy efficiency of a solar water heater, you need the solar energy factor (SEF) and solar fraction (SF). The solar energy factor is the system’s energy output divided by the electrical or gas energy input. The higher the resulting number, the greater the energy efficiency. Solar energy factors range from 1.0 to 11, with a common result of 2 or 3. The solar fraction is the portion of the total conventional hot water heating load (delivered energy and tank standby losses). The higher the solar fraction, the greater the solar heating source, which reduces the energy demand from the backup water heater. The solar fraction varies from 0 to 1.0 with typical solar factors running 0.5–0.75. What can I expect to spend on a solar water heating system? A typical residential solar water heater with home installation costs $4,000 and provides over two decades of service. 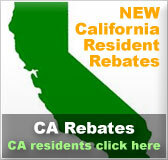 Solar water heaters can cost as little as $2,500 when installed during new home construction. During construction or refinancing, you can insert a solar water heater in a 30-year mortgage for between $13 and $20 per month. The federal income tax deduction for mortgage interest attributable to the solar system knocks that down by another $3 to $5 a month. So if your fuel savings are more than $15 per month, the solar investment is profitable immediately. On a monthly basis, you're saving more than you're paying. Solar water heaters operate with a fixed cost following installation. Free solar energy exempts you from fuel shortages or price hikes. 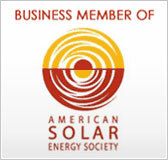 Solar water heater installation typically results in a 50 to 80% reduction in water heating bills. What is the annual operating cost of a solar water heating system? To calculate the operating costs, determine the system’s solar energy factor (SEF), the fuel type of your auxiliary tank (gas, electric, oil) and local utility costs. Convert the unit cost of electricity by kilowatt-hour (kWh).